Recommend me for your favorite PODCASTS! Yes, that is a direct pitch for help. My biggest task in growing my business right now is building up a larger audience, and past data has shown me that podcasts work really well. They connect me with great people (like you!) to write my blog posts & make my videos for. Plus, I really just want to get my message and my easy copywriting tips that’ll help well-meaning entrepreneurs out there. I want more good people to be successful, so I want them to have my copywriting tips. And in the past, podcast interviews have been THE BEST way for me to do that. 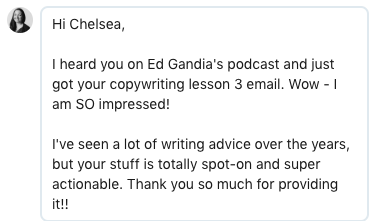 I always have fun chatting with the podcast host, and I also ALWAYS get emails from listeners about how much the copywriting and/or business advice I shared helped them out. How they were able to improve their websites & their marketing copy so that it “feels” better AND makes them more money. Plus, I’m super kind and a totally pleasurable guest. I’d love to be on it! Do you have a cool biz or niche podcast you ADORE & think my copywriting advice would be a good fit for their audience? Recommend me to the host! I have a handful of friends with podcasts (and YES, those interviews are in the works! ), and they LOVE IT when their listeners reach out with recommendations of people to have on the show. The world needs good businesses to be more successful, and my tips can help them get there. Hi [NAME OF PODCAST HOST]! [NAME OF SHOW] listener here, want to say that I’m a total fan of your show and love your interviews, especially the one with [NAME OF RECENT INTERVIEWEE]. I also wanted to pop in and recommend Chelsea Baldwin from Copy Power as someone to interview, because I think she’d be a great fit for our listener community. She runs Copy Power, which is a business all about helping non-writer entrepreneurs get the kind of voice, messaging, and copywriting they need to make a bigger impact with their work and get more attention. I know a lot of copywriters are really cool, but I especially like the way she teaches things – she makes the concepts really easy to understand, and gives a lot of great exercises to do that don’t feel like “writing” that still yield amazing website copy. Her email is chelsea@getcopypower.com, or I’m happy to make an introduction between you two! Hope you’re having a great day & can’t wait for your next episode! Yes, I’m being shameless in asking for this help. But no, I don’t care. I know the world will be a better place when better businesses & blogs can get the attention they deserve, and I know I’ve got a skill and a talent to help them get there. Plus, I just really care about helping good people, and this is the way I can best do that in the world.